Don Quixote is one hip novel. Cervantes forces his addled knight-errant to live up to reader expectations stemming from the previous sections published ten years early within his own narrative. It was meta and postmodern before meta and postmodern were cool. Nicodemus Legend is sort of the dime novel version—and proudly so. Pulp writer Ernest Pratt self-consciously modeled his western hero on himself, except he conspicuously lacked the virtues embodied by “the Knight of the Prairie.” However, with a little encouragement he starts to live up to his character’s heroic ideal in Legend: the Complete Series, now available on DVD from Mill Creek Entertainment. Legend was part of the first wave of programming on the UPN network, which explains why it was so short-lived. It had decent a decent pedigree as the co-creation of Next Generation and Deep Space Nine producer Michael Piller, featuring the star of MacGyver. In fact, Pratt/Legend is sort of a cowardly, dissipated analog to Richard Dean Anderson’s ever-resourceful government agent. The only way Pratt ever carries a gun is between his thumb and fore-finger. 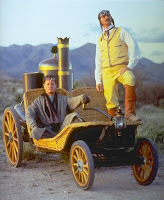 Although Pratt would prefer to stay half-crocked in a saloon, he is forced to travel to Sheridan, Colorado to clear his name in the two hour pilot. When he arrives, he receives a much warmer reception than he expected. Much to his confusion, the surrounding dirt-farmers believe he re-routed the local river, running it through their parched land instead of that of the local cattle baroness. Distinctly unamused, she has used her clout to trump up some rather embarrassing charges against him. It turns out the man responsible is Janos Bartok, a Hungarian inventor inspired by Nikolai Tesla, who headed west after winning a pyrrhic legal victory against Edison. Reluctantly, Pratt will join forces with Bartok to protect the local immigrant Hungarian farming community. Pratt is a rather hedonistic dandy, but he has a heart—and Bartok has a real knack for dispensing guilt trips. Eventually, they strike a long term bargain. Bartok will serve as Pratt’s technical advisor, creating all sorts of steampunky gadgetry for his use, while Pratt will stay engaged with the people of Sheridan, trying to be the Legend-like hero they need and writing up the results in his first-person novels. Like MacGyver, each remarkably consistent episode of Legend often ends with some form of conflict resolution or at least a bit of trickery that prevents bloodshed. Probably the best episodes include “Bone of Contention,” which suggests petroleum companies are not nearly as evil as Pratt had been led to expect, “Clueless in San Francisco,” featuring a fake séance and a brief but notable guest appearance by the great James Hong, and fittingly the final episode, “Skeletons in the Closet,” which starts with a weird uncredited cameo by Lara Flynn Boyle (completely at odds with the tone of the rest of the series), but concludes with a satisfying moment of shared comradery. Probably, the worst is “The Gospel According to Legend,” which seeks to score cheap points against Evangelicals and pharmaceutical companies, but at least it has Robert Englund doing his Elmer Gantry routine. Maybe things would have been different if Legend had been on a different network (it certainly couldn’t have hurt). The show is actually quite pleasant to spend time with. Anderson and John de Lancie (Q in the Star Trek franchises) forge an endearing bickering buddy chemistry and Ken Harrison’s catchy theme is both nostalgic and contemporary sounding. The art-imitates-life-imitates-art meta-ness is generally rendered with a light touch. It is often clever and rarely forced. However, Jarrad (co-director of D Train) Paul’s shticky recurring work has not aged well, but let’s face it, any character named “Skeeter” is probably a mistake. With its hot air balloons and mechanical buffalo, Legend is sort of like a Sunday school version of The Wild, Wild West. It means well and the directors (including Bob Balaban) keep it moving along at a good clip. 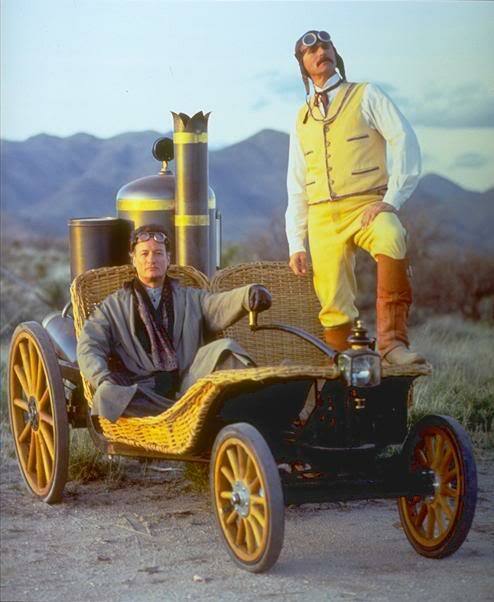 Anderson and de Lancie are just hammy enough to mesh together nicely and the series projects a sense of optimism that compensates for its occasional lectures regarding manifest destiny’s manifest excesses. Frankly, you have to admire the ambition it takes to launch a retro genre-straddling western. 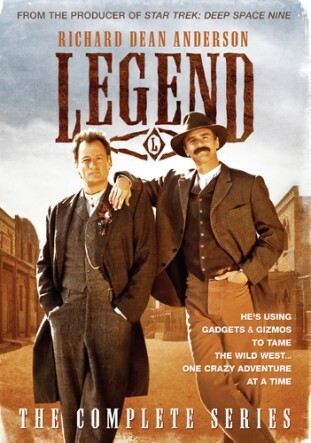 Worth taking a look at, all twelve episodes of Legend are now available as a two-DVD set from Mill Creek Entertainment.